In the years leading up to the American Revolution, both the British and the colonists used broadsides to influence public opinion. 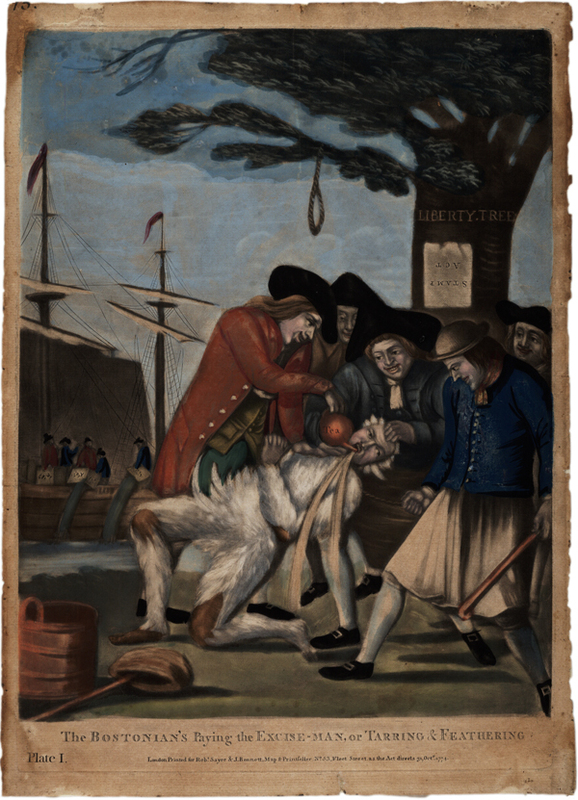 This broadside, "The Bostonian’s Paying the Excise-man, or Tarring & Feathering," printed in London in 1774, is a British depiction of the Bostonians’ treatment of a British customs officer, John Malcom. In Boston in January 1774, John Malcom argued with Bostonian George Hewes over Malcom’s rough treatment of a boy in the street. Malcom struck Hewes with his cane and fled the scene. Word of the assault spread, and Bostonians congregated at Malcom’s home, eventually dragging him outside. He was thrown into a cart and driven through the city streets. The crowd had Malcom stripped and covered first with tar and then feathers, giving him a "modern jacket." The riotous parade continued through the city, stopping periodically to demand Malcom renounce British authority, which he refused to do. The mob drove on past the Liberty Tree, where they threatened to hang Malcom. They put a rope around his neck, tied him to the gallows, and beat him with clubs. Malcom, severely injured, was eventually driven back to his home and unceremoniously rolled off the cart. 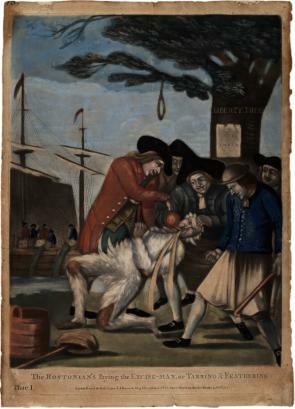 In this depiction of the events, the artist portrays the Bostonians with menacing faces, violently pouring tea down Malcom’s throat. Items representing events from the daylong assault are compressed into one scene, including the tar and feathers, a club, and a noose hanging from the Liberty Tree. The Boston Tea Party, which occurred a month before the attack on Malcom, appears in the background, linking the two events for the British audience. The Stamp Act is also depicted upside down on the Liberty Tree, serving as a reminder of the Stamp Act protests of 1765. A pdf of the broadside is available here. Why did a group of Bostonians attack John Malcom, a British customs officer? Explain how the artist has represented the political, economic, and social discord in Boston through specific images. Using information in the introduction as well as clues from the broadside, explain the illustrator’s point of view. Present evidence to support your answer. Why is this image considered to be an effective example of propaganda? Note: The following activities can be conducted as a collaborative lesson by an American history teacher and a fine arts colleague. Organize the students into small groups. Ask them to list and explain EXACTLY what they see in the image. Then the class as a whole can discuss their answers until they reach a consensus. Students can then be asked what mood is set by the actions depicted and by the choice of color and setting. Students must use elements from the image to prove their point. Compare this image by a British printer with Paul Revere’s image of the Boston Massacre, noting in particular the dramatic setting and action, the use of color, and the titles, etc. You can ask the students to debate the effectiveness of the broadsides as propaganda or assign an essay on that question. Remind the students to cite evidence from the documents to support their arguments.